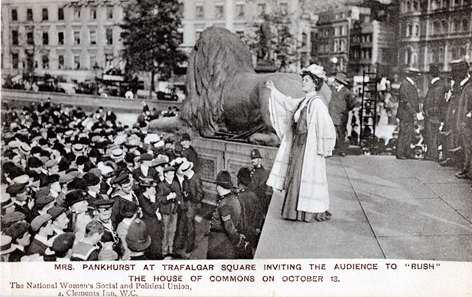 In September 1908 Emmeline Pankhurst together with Christabel Pankhurst and Flora Drummond decided the Women’s Social and Political Union (WSPU) should organise a rush on the House of Commons. The rush would be the first major protest of the new Parliament. In 8th October the leaflet came into the possession of the police and as a result they issued summonses to all three women for inciting the public to undertake an illegal act. Emmeline Pankhurst records that the police were present at the rally and had them under close surveillance, taking notes of the proceedings and following them [Emmeline Pankhurst My Own Story]. The next day the three women were served with the summonses instructing them to attend Bow Street police station that afternoon. They did not attend, instead going to a WSPU meeting in Queen’s Hall. Although the police were present at this meeting they did not arrest the women, but again left instruction that they should attend Bow Street the following morning, the 13th, the day of the ‘rush’. Again the women failed to attend, remaining at large the whole day, but when they returned to the WSPU offices at 6pm the police arrested them. They consequently were unable to attend the ‘rush’ themselves. 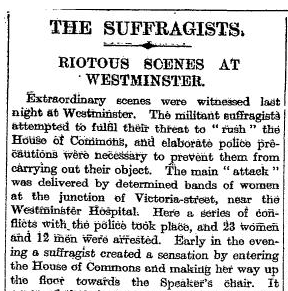 Despite the absence of the three WSPU leaders 60,000 people gathered in Parliament Square and attempts were made by suffragettes to break through the 5000 strong police cordon to rush the House, but none succeeded. Thirty-seven arrests were made, ten people were taken to hospital and seven police officers were placed on the sick list as a result of their injuries. Although no one broke through the cordon one women did reach the floor of the Commons Chamber. Mrs Travers Symons, Keir Hardie MP’s secretary, in the building on business, was allowed into Members’ Lobby. However, rather than make her way to the Ladies’ Gallery as expected she ran through the doors into the Chamber where MPs were debating the Children’s Bill. She shouted ‘leave off discussing the children’s question and give votes to women first’ before being bodily removed by the attendant. 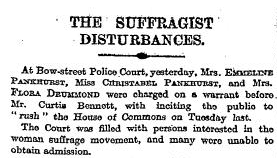 The day after the rush Emmeline Pankhurst, Flora Drummond and Christabel Pankhurst appeared at Bow Street court charged with conduct likely to provoke a breach of the peace. Their subsequent trial lasted two days and attracted much press and public attention. 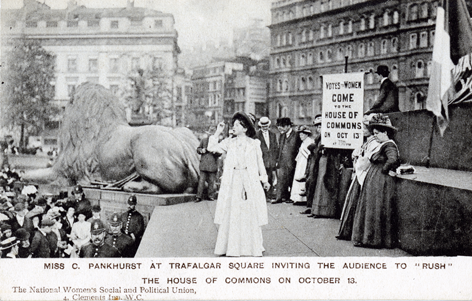 Christabel Pankhurst, a trained lawyer (though as a women unable to practice professionally) undertook their defence and caused a sensation when she called two cabinet ministers as witnesses. The judge found all three defendants guilty, and when they refused to pay fines, imprisoned them. 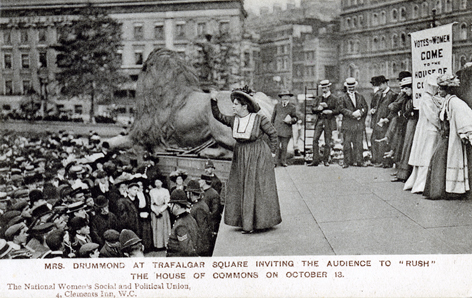 The WSPU nevertheless considered the whole event a success because of the publicity they had received for the campaign. 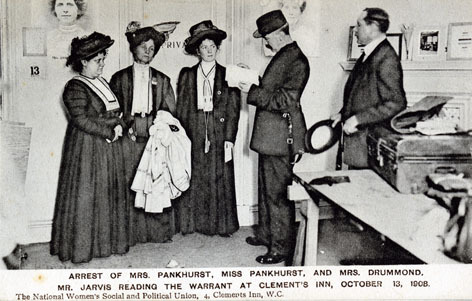 Emmeline Pankhurst was released from Holloway Prison in December 1908. She was met by a carriage escorted by two bands, women riding white horses and 200 women in white dresses . The parade was followed by a breakfast of 350 people to celebrate the achievements of her action and she was awarded a WSPU medal to mark the event. On the front of the medal were details of where Mrs Pankhurst had been imprisoned, ‘Holloway’, Hospital block, second floor, cell 4 – abbreviated to ‘H.2 4’. The date on the bar of the medal 8th October 1908, is the date the police issued the original summons.